Comprehensive list of lessons to help guide you (as the teacher) and monitor and track the progress of each child. 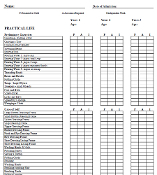 Print a set for each child, fill in the checklist as each lesson is presented, is being worked on, or has been mastered by the child. This makes record keeping and reporting to parents very easy!